Brannan Cottage Inn, built in 1860 by Calistoga’s founder Sam Brannan and renovated in 2014, has won an Award of Merit for Historic Preservation from Napa County Landmarks. The award recognizes “preservation excellence in materials, features, finishes, and construction techniques that define the historical significance of the property.” Inn owner Amar Patel says, “We are humbled and honored to receive this award. It’s very gratifying that the hard work that went into this project be recognized by the very people who understand the commitment required.” Napa County Landmarks was a valued partner and historical resource during the eight month long restoration and renovation process. For over four decades, Napa County Landmarks (NCL) has presented Awards of Merit to recognize exemplary efforts in Historic Preservation. The Award is given to businesses, organizations, and individuals whose project or work represents outstanding contributions and excellence in preservation, restoration, rehabilitation, and adaptive re-use as it relates to historic buildings, structures, and landscapes within Napa County. If you and your significant other are looking for a romantic getaway where you can enjoy fine food, wine and each other, have we got a spot for you. 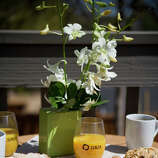 It’s about the most mojo-inspiring place you can stay, a little cottage set in bucolic Calistoga, California. 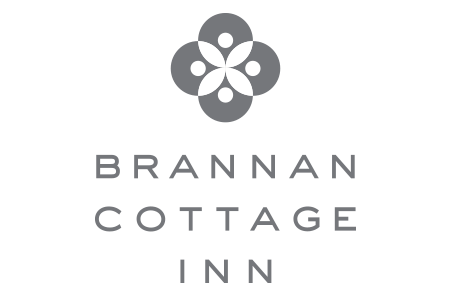 We’re talking about the charming Brannan Cottage Inn which just sent out a release about two new food and wine packages. One is called “Culinary Calistoga” and includes a smorgasbord of local tasting treats from extra virgin olive oil and limited edition wines to appetizers and exclusive food and wine pairing experiences from legendary wineries, chefs and restaurants. The other , “Harvest Wine Experience capitalizes on the harvest season and is only available September 1 through October 31, 2015” and provides an intimate, rustic wine tasting experience at Coquerel Family Wine Estate with lunch and a vineyard stroll. “Culinary Calistoga” comes with a welcome gift of Calistoga Olive Oil Company EVOO and Balsamic 100ml gift pack to set the mood, locavore-style; seasonal appetizer at Calistoga Kitchen (just down the street) where legendary Chef Rick Warkel wows Brannan Cottage Inn guests with an ever-changing treat for the taste buds; appetizer available Thursday-Saturday dinner and Sunday brunch or a comp charcuterie plate provided at the Inn. Additional amorous amenities include a private wine tasting at VGS Chateau Potelle’s St. Helena Tasting House & Gardens of four varieties served in specially designed Reidel glassware and paired with tasty bites from Napa’s legendary La Toque restaurant for an additional $45. Rates for this plan start at $319 a night with a charming rom equipped with free WiFi and charging dock, plush Frette linens and robes, in-room illy espresso machine, convenient mini-fridge, 48” flat screen TV with complimentary streamed entertainment, and downtown adventures just outside the door. The “Harvest Wine Experience” sounds heavenly with priivate flight tasting for two hosted by Stacey Pytlewski on Coquerel’s “Walnut Wash Vineyard” of four whites and four reds; wines paired with a gourmet box lunch prepared by Winery Chefs of Napa Valley; a stroll through the vineyard to discuss the varietals planted on the property and learn about wine making techniques used at this tiny (2,000 total case production) winery. Rates for this begin at $359 a night mid-week for Historic Queen accommodations and are offered from September through the end of October. Picture yourself and your lover in a historical Brannan Cottage that was built way back when Abe Lincoln was President where you can take the waters of Calistoga’s hot springs, sip fine wines and play house in adorable Victorian-style four guestrooms that sit in the main 1860 building furnished in new and antique appointments with dark floors and ornate wallpaper that blend seamlessly with contemporary amenities like espresso machines, flat screen TVs, rain showers, and heated tile floors in the ensuite bathrooms. Two elevated Deluxe King rooms in Brannan House, a second building added to the property in the 1950s, offer more contemporary décor and extra comforts like a private garden entrance, fireplace, terrace and a bit more living space. Each room takes on a personality of its own reflected by unique color schemes paired with carefully chosen furnishings and wall art depicting Calistoga’s past through historic photos. It’s love at first sight. With its arcaded porch and box molding ceilings, the Brannan Cottage Inn in Calistoga showcases the finest in restored Victorian architecture combined with modern style and amenities. Innkeeper Eden Umble recommends the famous Calistoga hot springs. 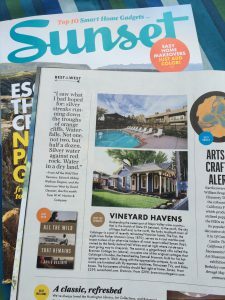 Calistoga, CA, June 1, 2015 Sunset Travel Award In Sunset Magazine’s June issue, Brannan Cottage Inn wins the 2015 Travel Award for “Best Hotel Renovation” of the West. The Inn joins 30 top destinations in lodging, dining, cultural tourism, outdoor adventure, environmental stewardship, and more on receiving this distinguished honor within the iconic magazine’s inaugural awards issue. The Inn celebrates this award with a summer-long special rate. Celebrate this epic award with the Inn by booking its special mid-week Summer Celebration rate starting at $279/night for a luxuriously modernized room complete with complimentary WiFi and charging dock, plush Frette linens and robes, in-room illy espresso machine, convenient mini-fridge, 48” flat screen TV with complimentary streamed entertainment, and more. Special includes complimentary wine tasting for two at select local wineries such as W.H. Smith Wines and admission to the Sharpsteen Museum, Calistoga’s first-class historical museum, to delve into the region’s fascinating past. Valid June 1 to August 27; blackout dates apply and subject to availability, For reservations, please visit brannancottageinn.com/special-offers or call (707) 942-4200. Built when Abe Lincoln was President, and a silent witness to Calistoga’s ascent as a hot springs destination, Brannan Cottage Inn is a significant piece of Napa Valley history and listed on the National Register of Historic Places. An extensive eight month renovation transformed this iconic six-room property—acknowledged as the last remaining building still in its original location, and one of only 3 surviving buildings from town founder Samuel Brannan’s visionary resort—into a thoroughly modern lodging experience. Four guestrooms in the main 1860 building feature Victorian-flavored furnishings and light fixtures, dark floors and ornate wallpaper that blend seamlessly with contemporary amenities like illy Espresso machines, flat screen TVs, rain showers, and heated tile floors in the ensuite bathrooms. Two elevated Deluxe King rooms in Brannan House, a second building added to the property in the 1950s, offer more contemporary décor and extra comforts like a private garden entrance, fireplace, terrace and a bit more living space. Each room has its own character expressed through its unique color scheme, paired with carefully chosen furnishings and wall art depicting Calistoga’s past through historic photos. Details: $299-$349. 109 Wappo Ave., Calistoga, www.brannancottageinn.com. All of us at Brannan Cottage Inn are thrilled to be mentioned in this great roundup of best small towns across America. See #7, Calistoga, mention below. Read complete story here. Calistoga may be the only American city named for a spoonerism. Hoping to capitalize on local geothermal waters, in 1866 town founder Sam Brannan (California’s first millionaire) declared that he wanted to make the place “the Saratoga of California,” which tipsily tumbled out as “the Calistoga of Sarafornia.” The name stuck, and Brannan still looms large around town—the just-renovated Indian Springs, California’s oldest continuously operated spa, recently opened its first restaurant, named Sam’s Social Club in his honor. The Brannan Cottage Inn, built by the man himself in 1860, also just renovated and reopened, offering guests relaxed Victorian chic. The northernmost town in the Napa Valley, there’s also food and wine galore in Calistoga, including at new French bistro Evangeline, helmed by multiple-Michelin-starred chef Brandon Sharp. Visitors hoping to enjoy local bounty would do well to plan around the annual Harvest Table Event in September, when a 1,000-foot-long table with food from 20 local restaurants is set up in the middle of a downtown street. We admit we’re pretty jazzed to be featured in the April 2015 issue of Sunset as Best of the West. (It’s even better to be mentioned alongside our friends at @SenzaHotelNapa, another historic property which has recently been revamped, which is owned by our friends & winery partners at HALL Wines.) It’s most gratifying that this reimagined hotel built by Calistoga town founder Samuel Brannan in 1860 is getting such a terrific response from media and guests alike, and prompting lots of calls. If you’re planning on visiting us this summer or fall, we recommend booking early; many weekends are already sold out. More Sunset love: the Inn is one of four finalists for Best Hotel/Inn Renovation in their first Travel Awards. A 2014 renovation injected glamour and vintage-yet-modern style into this small inn whose centerpiece is an 1860s cottage from Calistoga’s original spa era. 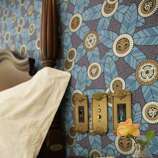 Stained oak floors, wainscoting, and retro bathroom fixtures recall Victorian times, period electrical switch plates and ornate wallpaper the flapper era. Contemporary comfort is the innkeepers’ ultimate goal, though. The beds have plush mattresses and high-thread-count sheets, and rooms are equipped with large flat-screen TVs, electronics charging stations, and shiny new Illy coffee machines. Green touches abound, most visibly in the LED lighting throughout the property. A tall palm, even taller twin cypresses, and an elm tree thought to be 300 years old shade the inn. 1860 was a pretty good year. Dickens published the first installment of Great Expectations. Lincoln got elected. But it was tough to find a place to watch In a World… on streaming. This is all that remains of a once-14-cottage-strong spread. They’ve done good things with it. Things that’ll make you want to put a leather bag into a car, drive the car a little bit, take the bag out of the car, drop it in the Victorian room next to the square grand piano and then do a little relaxed stretch. There’s arches. There’s wraparound porches. There’s a sitting area by the fireplace. Oh, and Netflix on Roku, a rainfall shower and (in a week or so) a concierge app. That last thing is important if you’re going to go anywhere aside from that shower. It’ll help you book any necessary wine tours and hot-air balloon rides. The bad news: the spa they’ve partnered with, the safe place with the massages and mud baths, is three blocks away. Three. 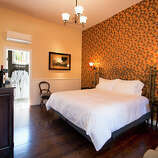 Brannan Cottage Inn in Calistoga offers six rooms, four that have a Victorian feel and a modern twist, plus two new update-to-date suites. The newly opened Brannan Cottage Inn in Calistoga may offer just six rooms, but each could be cause for celebration — or the site of one. Not only are they part of a handsomely renovated 1860s cottage from the landmark Calistoga Hot Springs Hotel, these added lodgings make it ever so slightly easier to spend a weekend in Napa Valley, where demand for rooms is intense virtually year-round. Opened as Hotel Luca in 2009, North Block’s name change in mid-2011 came from shedding a “heavy faux-Italian theme that never resonated with our travelers,” Accornero says. The newer hip, sometimes cheeky, approach, such as leaving martini setups (with locally made vodka) in rooms instead of wine, helps draw a steady stream of guests from Northern California, Los Angeles and the East Coast. As of early August, Senza is the newest name in Yountville-area lodgings, one that marks not just the rebranding of the former La Residence, but also a dramatic expansion and renovation. Owned by Craig and Kathryn Hall of Hall Wines, Senza boasts 18 new suites and 15 renovated rooms with a luxurious modern aesthetic, in keeping with the contemporary sculptures dotting the 2-acre site and the sleek lobby, where complimentary pastries from Bouchon are served at breakfast, and wine and cheese in the evening. Tucked among vineyards off Highway 29 near Bistro Don Giovanni, Senza also includes the Parker Mansion, built about 1870, which suffered minor damage from the Aug. 24 earthquake (see sidebar). Its eight newly updated rooms are expected to open soon, if they haven’t by press time. He also added a hallway upstairs, where the 12 inviting rooms include large glass showers, tall armoires and Keurig coffeemakers. “We did all we could to make it beautiful inside and out, given the restrictions” on a vintage structure, Hoffmeister says. That’s something Amar Patel, whose family owns the new Brannan Cottage Inn and two other Napa hotels, understands. The cottage’s four rooms on the original first floor have “that older Victorian look and feel, with a modern twist,” Patel says, while two suites in the newer addition are “a little more up-to-date”; all have high-end amenities and electronics. And this being Napa Valley, once word gets out, all will fill up fast. Call, don’t click: Websites, particularly third-party booking sites such as Hotels.com or Expedia, may not have access to all of a hotel’s inventory, especially recently canceled reservations, several hoteliers advise. “Even with weekends being sold out in October, we get cancellations that don’t always translate to the website,” says Amar Patel, whose family owns the Chablis Inn in Napa and the Comfort Inn and Brannan Cottage Inn in Calistoga. “My best advice is to contact the hotels directly. They’re the best asset to figure out when you can stay, and they can recommend where to stay if you can’t stay there.” A call to luxurious Bardessono in Yountville, where peak weekends require three-night minimum stays, means “we can take a look and might find if there is a one-night stay available, or other wiggle room,” says Kini Sanborn, director of sales and marketing. Know when to book: It’s fairly obvious why winter weekends have more availability. But those of us within an easy drive should not dismiss a getaway despite the chill. “January through March, you’ll have lower room rates and more attention in restaurants and tasting rooms,” notes Ann Heeger, hotel manager at the Vintage Inn and Villagio Inn and Spa in Yountville. “As locals, we like that, too.” Certain days are better for actually making reservations. Saturdays are the “softest” time for online bookings, according to Patel, unlike Mondays and Tuesdays, when folks are hunkered at their desks. If a room has suddenly opened up, Saturday is the best time to try to claim it. Also, check if your desired hotel has a seven- or 14-day cancellation policy, as is typical, then call to see if someone has avoided a penalty by canceling just before that window. Prove your loyalty: “It’s all about relationships,” says Ty Accornero, general manager of North Block in Yountville, who keeps a waitlist when its 20 plush rooms are full. “We love to take extra special care of repeat guests, and those who refer friends and family,” he says, and that includes bumping them up the list. Prices reflect November rates, when more rooms are available. Former Chronicle Travel Editor Jeanne Cooper writes frequently about California and Hawaii.